A meshmorizing place where the rain falls very heavy indeed. It is a hard place to experience unless you have a powerful computer with a good video card – all that rain is really graphically heavy. You land in a shack that is nice and dry, but as soon as you go outside, you will experience the heavy rain. The rain is everywhere – except a small corner of the SIM where there is a ladder to a platform from where you have a great view of the SIM. I didn’t climb the ladder, but I have heard that I should have tried. It seems to be hard to do as there are heavy wind gusts that will try to blow you off, so maybe I shall try that when I go back. At another corner of the SIM you will find an area of monolithic blocks. They are lined up and they look beautiful. 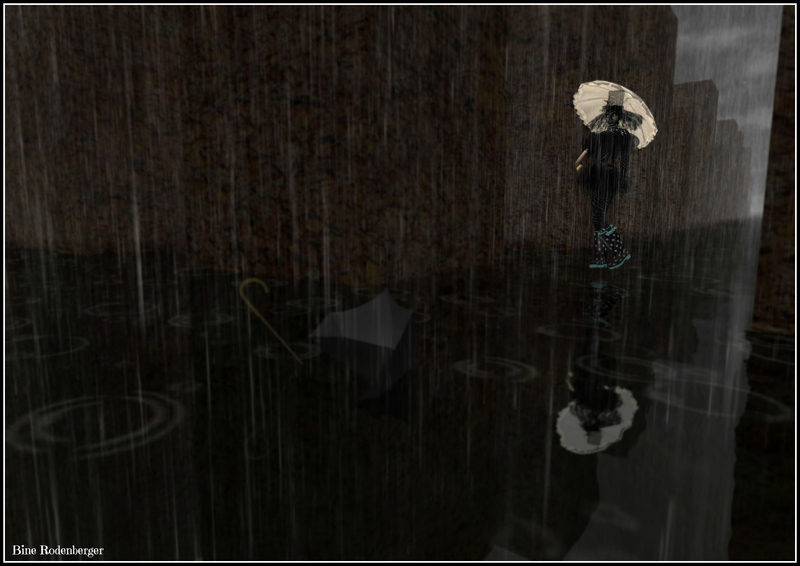 I found a pair of wellies and an umbrella in Bine’s inventory that I found fitting for this snapshot. At another place on the SIM you will find big instruments and other oversized stuff. I particularly liked an over-turned waste bucked where you could seek shelter from the rain. 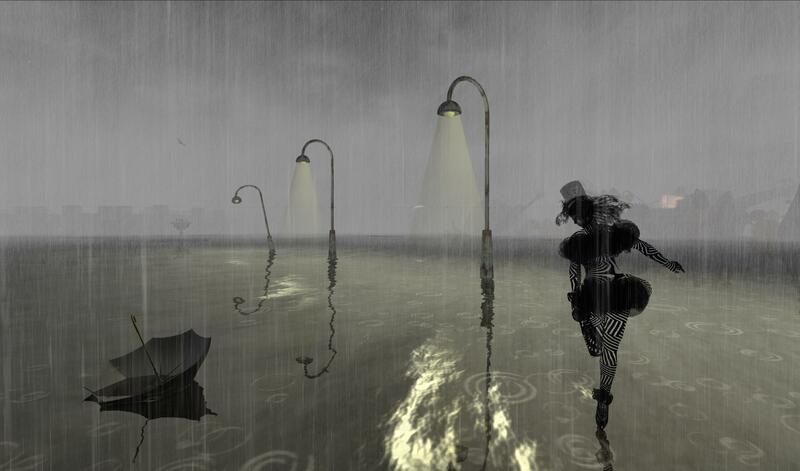 Rain in SL can be tricky to manage. Most rain-making-script send rain through roofs and walls, but this doesn’t and that did impress me greatly.